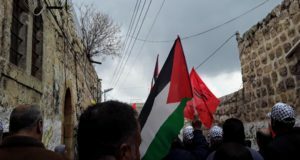 On the morning of Tuesday 15 September, at approximately 8:30am, a Palestinian shepherd from the Palestinian village of Einabus, to the south of Nablus, was shot and two others beaten by Israeli settlers. 11 settlers from the illegal Yitzhar settlement, 3 of them masked and all armed with M-16s attacked Hazzaì Allan and his sheep as he grazed his flock on a hill close to the village, killing 15 sheep and stealing 10 more. The settlers ordered Hazzai down on to the ground, beating him and spraying him and his dog with pepper spray. Hazzai’s brother Nader responded to a distress call Hazzai had managed to make and was shot in the chest while attempting to protect his brother from further beating. Villagers attempted to chase the settlers away and a third man, Abdil Rhamn, the nephew of Nader, was beaten with heavy grazing to the head. Israeli police arrived on the scene, referred by a call made to the PA Police by a local Palestinian. The Israeli forces prevented an ambulance from entering the village for some time. Eventually, Nader Allan and Abdil Rhamn were taken to Rafidia Hospital in Nablus, where they are receiving treatment. The bullet that entered Nader’s chest caused superficial wounds, fortunately not penetrating any major organs. This is the third time he has been shot by settlers. His brother Hazzai was taken from Einabus to the police station in the illegal settlement of Ariel in Salfit district for questioning. Wednesday 9 September Urif village was attacked by settlers who threw stones and damaged a Palestinian home. Wednesday 9 September the village of Asira al Qibliya was subject to an invasion by masked, armed settlers. Thursday 10 and Sunday 13 September was the scene of several arson attacks on a home under construction in the village of Burin. Violent and often fatal attacks by armed settler youth in the illegal settlements surrounding Nablus are a common part of Palestinian lives. One year ago settlers from the illegal settlement of Yitzhar rampaged through Asira al Qibliya shooting a number of residents and causing damage to property. 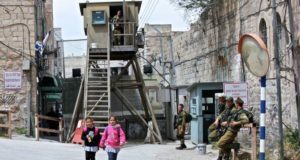 The incident was described by the then Israeli Prime Minister, Ehud Barak as a ‘pogram’ and condemned at the time but despite footage of the incident the Israeli Government has not brought forward charges against any settlers. In a later incident the settlers shot dead a 14 year old boy from the village. In a similar incident in September 2008 a shepherd boy from the village of Aqraba in the east was shot dead by settlers when out grazing his sheep in the Jordan valley area. Settlers have also been responsible for the destruction of thousands of dunums of land planted with olive trees, vital to the local economy. Settlers engage in what they call a ‘price tag’ campaign whereby if an illegal outpost is taken down in one part of the West Bank settlers rampage, destroy and attack Palestinians and their property in retaliation. 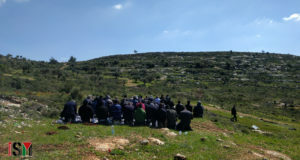 Settlements in the occupied territories and outposts are considered illegal under international law and despite their obligation to protect the local population as an occupying force the Israeli Government continues to condone and support the violent and illegal acts of settlers in the occupied territories.